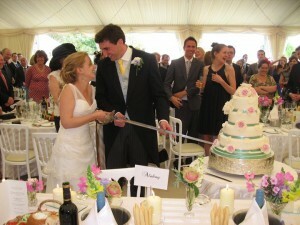 This is one of my favourite cakes of the wedding season so far. It was made for the lovely Chris and Michaella’s April wedding which took place at the Medicine Garden in Cobham, Surrey. This is a beautiful venue in a walled garden which coupled with a stunning marquee made for the most beautiful country wedding setting. 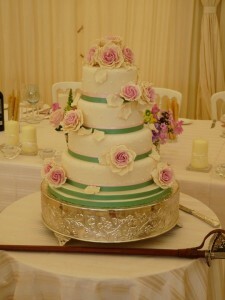 The colour scheme was dusky pink and sage green which we replicated in the ribbon colour on the cake. I love love love it!